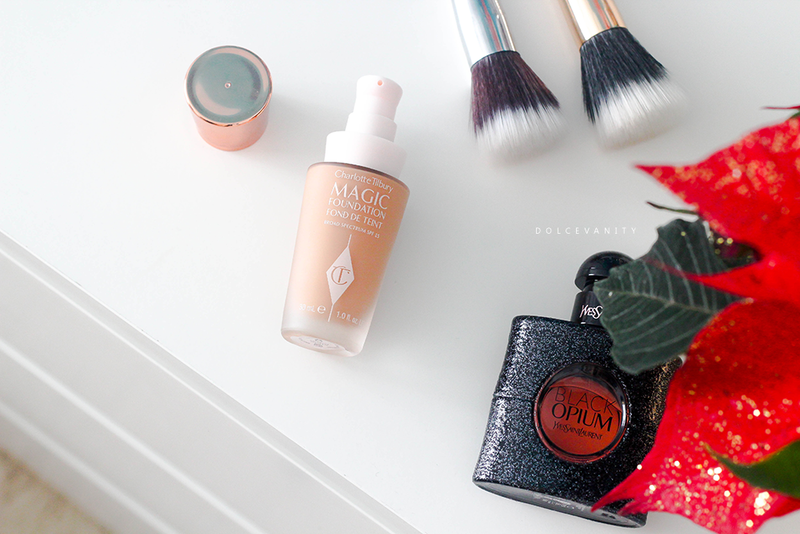 Charlotte Tilbury Magic Foundation Experience & First Impressions. 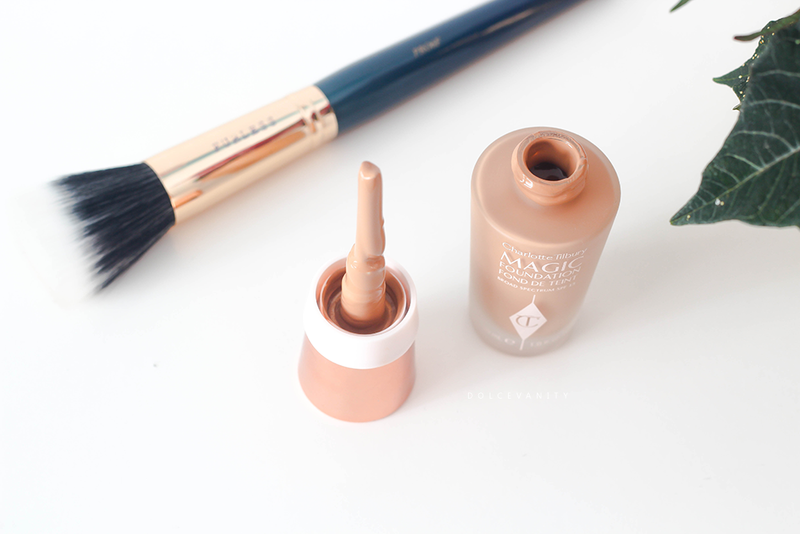 Magic Foundation is a miracle in a bottle that transforms skin for all ages, skin tones and skin types. I have worked with laboratories for five years to create a “hyper-intelligent” formula that gives full-coverage yet feels completely weightless, with all the anti-ageing and protective benefits of a luxury skin cream. It conceals imperfections, glides on like a dream, and literally feels like a second skin. 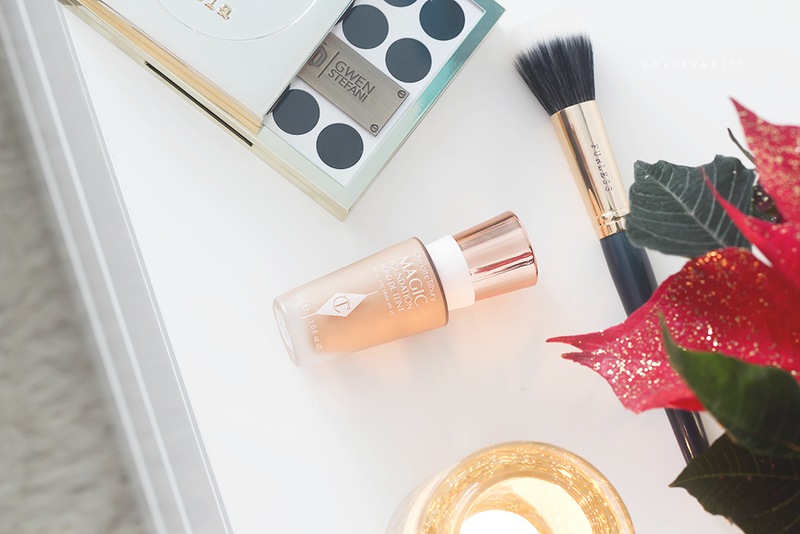 Whether your skin needs just a bit of perfecting, or you struggle with a frustrating issue like acne, melasma or rosacea, Magic Foundation will give you a perfect looking skin day, every day! Choose from 15 beautiful demi-matte shades to match every skin tone from Lily Cole to Lupita Nyongo. This foundation's aim is to help create perfect looking skin no matter your skin concerns. Reduce redness, open pores disappear, cover imperfections, undereye bags - bye, and brighten dull skin. Whether you have, acne, normal tired skin, mature skin, pigmentation, large pores, redness, dark circles, birthmarks or scarring. Magic Foundation is said to target and banish all these concerns. Charlotte Tilbury's Magic Foundation was launched in the last quarter of this year. I watched some YouTube tutorials where Charlotte applied the foundation on different skintones and skin concerns. They say it's available in 15 shades yet I only count 13 shades including one .5 shade on the website, so unless 2 are in development or at a counter, it should be very easy to find a colour to suit everyone. I decided to bite the bullet and get my first Tilbury product, not being anywhere near a counter to be matched, I gambled with a shade. The foundation arrived the next day. One thing I can say that I like is, they send you 3 sample sachets therefore you don't need to open the bottle -which will become void for you to return if incorrect- to test if it's correct. They send you the exact shade and the shade above & below. Sometimes finding that perfect shade can be a nightmare. If you use the Foundation Finder it can aide you. I'm an olive complexion with yellow undertones but my skin finds it hard to tan and it tans on ocassion when it wants too. I had to send back shade 9 which was too dark, it was for a deep golden amber for deep to dark skin tones with neutral undertones, although when I applied it from the sachet it looked ok and then it started to slightly oxidize. Shade 8 (Shade 8 is a neutral deep tan for Tan to Deep Skin Tones with Warm Golden or Olive Undertones) or maybe Shade 7 (Shade 7 is a neutral caramel for Medium to Tan Skin Tones with Warm Golden or Olive Undertones) would of been a good match to even mix. I used the shade 8 sachet and it appeared good so I arranged a return. I sent it back a few days later and awaited my return. A week later. Nothing. Tweets sent. No reply. An email sent. No reply. Two weeks later. Still nothing. I spent 2 days trying to get through to customer service and after being sent to an o2 voicemail, an American voicemail inbox and then finally a personalised Charlotte Tilbury customer service voicemail I got through one morning. No apology was given or any explanation where my return or order had got to, was just simply, name and what shade do you want, ok return being sent. After nearly a month since receiving the original and sending it back the next day I got my replacement. Not long after an email was sent about the company moving email servers so emails were lost / unanswered due to this. I thought it could've been explained to me when I asked what happened to my unanswered emails. It left me thinking, as bloggers we've been so spoilt, we forget that when we're sent things from companies we 9/10 get the best of the batch, sent things same day by courier or first class. We then promote these companies and products and forget about everything else consumers may have to go through with returns, customer service etc. It was a nightmare and reminded me why online makeup shopping is really a dud unless you're 100% sure from prior purchase. An SPF15 with a very fluid liquid the consistency reminds me of the MAC Cosmetics Studio Fix. It comes in a 30ml bottle with a pump applicator which makes it very easy to control how much foundation you want. The finish should be a demi-matte, taking away the natural shine on the face but allowing it to still be radiant. Laricyl: This is a concentrated mushroom extract. In French medical legend it was highly sought after as an elixir for longer life. Triple action: It improves skin firmness, Magically tightens pores, Floods the skin with moisture. Hyaluronic Filling Spheres: These genius spheres fill with moisture as they are absorbed into the skin, plumping the skin with water, reversing wrinkle grooves. 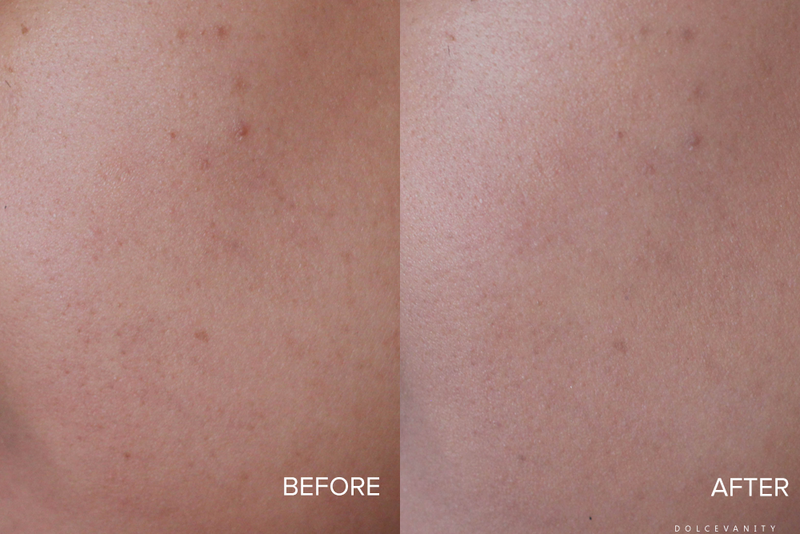 This takes effect almost immediately, and within 1 hour your skin is a smoothed and re-texturised canvas. Supercharged Vitamin C (VC-IP): This brand-new skin hero ingredient has been tested clinically in several In-Vivo tests and is the first time it is integrated into a foundation. Vitamin C is a well-known anti-oxidant that revives skin for a glowing, lit-from-within complexion. VC-IP, super-charged Vitamin C, has been tested against the leading vitamin C ingredient Ascorbic Acid (AsA), and is far more effective at feeding the skin’s cells with energy. It converts into pure vitamin C within the skin, giving protection and energy directly to the skin’s cells and DNA. It's always good to see a foundation that also boasts skincare benefits as most people with skin concerns have trouble with varied foundations due to irritations or being too heavy. Swatches of No.8 on my arm. Deep GoldenJust looking at the swatches and the models they've got on the website and YouTube for this shade makes me really wonder as I don't see how this colour was suited to them! It claims to help pigmentation and redness so I tried it on a few little pimples and where I have a little pigmentation. The colour in the after photo is a little off (winter skies) but you can see it doesn't really hide imperfections and the redness goes slightly ashy. Applied on the skin it doesn't feel heavy or like the skin can't breathe, I apply it with a duo fibre or buffing brush. It has an almost velvet touch finish to it when it starts to settle on the skin. It goes on well on the face, I apply it in natural lighting, after about 20 minutes it starts to oxidize on my skin and get darker and comes off more orange on my face. Although it feels lightweight, my skin started to feel a little dry after about 50 minutes. I didn't get samples with this return & exchange so I might of gone with the 7, although I feel I'd have to do a mix if the 7 didn't work out. With the sachet sample I didn't really experience any oxidizing. As it got darker on the foundation brush, it just built up more on the face and got even darker if I was to add more from the brush. I've not tried the beauty blender but I might see if it helps but beauty blenders tend to smooth out the product and lessen the consistency. The imperfections weren't hidden or helped. I feel that I'd still need to do a colour corrector and concealer but this wasn't going to help my imperfections alone even if the colour was perfect. Give a woman the right makeup & she can conquer the world. There are so many claims to live up too and I've yet to see a blogger say something other than positive about this foundation but for me? I wouldn't say I'd purchase another. I feel from the shades that I've had samples of there's quite a jump of colour between the shades. If you watch the tutorials online compared to the models they have for these foundations on the website, their skintones vary and it doesn't make it easy to really know what your shade is. The oxidizing is a huge issue for me! My first experience with the brand from start to finish hasn't been ideal, pretty off-putting if honest. If I'm paying £29.95 for a foundation that has a lot of magic powers, I'd expect to see the magic. I've read that some people even when matched at the counter, still ended up with oxidizing & weren't 100% impressed with their match. If I was asked to choose between my Barry M foundation and this, I'd choose the one that only costs me £5.99, saving myself £23.96. Have you tried this foundation? Or anything from the Charlotte Tilbury brand? I haven't tried any of the Charlotte Tilbury foundations yet (although they are on my wishlist) a bit worried to hear that they oxidise like this. I thought I was the only one to notice that but when read reviews from people who purchased the item, I experienced the same thing as them. It's definitely a pass from me. What a thorough review! It's interesting to hear you had a very challenging customer service experience. I think the only people I know who use CT are beauty bloggers, so their experience isn't always standard, clearly. Until I get a great CT makeup counter near me, I think I'll pass sadly. I had trying to color match online. Nightmare indeed - thanks for your comment. I've wanted to try CT products for a long time. Particularly foundation because I'm always curious to see if I can find something more amazing than what I'm using now (so far I haven't). But Charlotte makes so many over the top claims about her products, particularly this foundation. I was always wondering when someone would review it more objectively. Thanks for the review!